Trevor Plouffe was a mess in his first taste of the majors last year, going 6-for-41 (.146) with 14 strikeouts and zero walks, and began this season back at Triple-A for the fourth year in a row, where he'd hit just .253 with a .303 on-base percentage and .419 slugging percentage in 1,194 plate appearances. Recalled to help replace the injured Tsuyoshi Nishioka at shortstop in early May, he went 12-for-60 (.200) with sloppy defense and was sent back to Rochester. At that point Plouffe was a 25-year-old with 1,200 unimpressive plate appearances at Triple-A who had gone 18-for-101 (.178) in the majors and the Twins seemed convinced that he lacked the defensive skills to be a regular shortstop, which left "utility man" as his upside. And then a funny thing happened: Plouffe went back to Rochester and destroyed Triple-A pitching, hitting so well that the Twins gave orders to play him at first base and right field. Plouffe had never played a single inning at either position through his first seven-plus seasons as a pro, but after starting seven times at first base and six times in right field the Twins called him back up last week. He was supposed to start at first base Thursday, but instead moved to designated hitter when Jim Thome was a late scratch from the lineup with a sprained toe, and then Plouffe started in right field for all three weekend games against the Royals. His time as a regular right fielder figures to be limited, as the Twins are hoping to get Denard Span and Jason Kubel back from the disabled list relatively soon and once that happens the outfield logjam won't leave any room for Plouffe. However, the far bigger question is whether Plouffe's performance at Triple-A this season is for real and what that means for his suddenly resuscitated prospect status. After seven mediocre-at-best years in the minors, including three consecutive underwhelming seasons at Triple-A, has Plouffe truly gone from a light-hitting, shaky defensive shortstop to a slugging corner outfielder at age 25? Probably not, as focusing on 50 good games following seven so-so years doesn't usually make sense, but Plouffe's performance at Triple-A goes well beyond good and Span is another former Twins first-round pick who had a very similar story. Coming into the 2008 season Span was a 24-year-old repeating Triple-A after hitting just .267 with a .323 on-base percentage and .355 slugging percentage in 139 games the previous year and had hit just .283/.348/.348 overall in five pro seasons. Much like Plouffe he narrowly clung to a spot on my annual list of the Twins' top 40 prospects and seemed destined for a career as a bench player. And then Span hit .340 in 40 games at Triple-A, showing dramatically improved patience and power. Called up to Minnesota for his big-league debut in mid-2008, he hit .294/.387/.432 in 93 games and then showed it was no fluke by hitting .311/.392/.415 as an everyday player in 2009. Span's production declined to .264/.331/.348 in 153 games last season, but he bounced back to hit .294/.361/.385 in 56 games this year before suffering a concussion on June 3. Span looked like a first-round bust heading into 2008, but an impressive 40-game stretch at Triple-A forced his way into the Twins' plans and now he's one of the better all-around center fielders and leadoff men in the league, hitting .289/.366/.391 through 447 career games with the Twins after batting just .283/.348/.348 through his first 507 games in the minors. Span's overall skill set remains mostly the same, but he suddenly became a different player in 2008. Span making massive strides at age 24 after five unimpressive seasons in the minors doesn't actually make it any more likely that Plouffe will do the same at age 25 after seven mediocre seasons under his belt, but it does provide an example that's both recent enough and similar enough to warrant some optimism. And as far as disappointing former first-round picks having two-month breakouts at Triple-A go, Plouffe stands out even more than Span did. What made Span's breakout at Triple-A more impressive than just another fluky 40 games was that his lofty batting average also came along with significant improvements in plate discipline, strike-zone control, and power. In other words, he didn't just hit .340 for 40 games, he hit .340 with more walks, fewer strikeouts, and more power. Plouffe is similar in that his breakout at Triple-A wasn't simply driven by a fluky batting average. Plouffe also smacked 15 homers in 51 games, which matched his career-high for a season and represented a 235 percent leap in Isolated Power compared to his previous career mark. He continued to strike out at around the same rate, but drew about 25 percent more walks than usual. Plouffe didn't just hit .313 for 51 games, he hit .313 with twice as much power and 25 percent more walks while maintaining a similar strikeout rate. He showed signs of changing. With that said, in the grand scheme of things 51 games is still a very small sample, particularly within the context of a seven-season career that looks nothing like it. However, these aren't just any 51 games. Not only did Plouffe show improvements beyond his lofty batting average, those improvements added up to perhaps the most dominant performance any Twins hitting prospect has had at Rochester in ... well, ever. As is often the case with minor leaguers the raw numbers don't tell the whole story. Plouffe hitting .313/.384/.635 would be impressive anywhere, but rarely does anyone approach those numbers in the pitcher-friendly International League. Not only does his 1.019 OPS lead the league this year, Carlos Santana and Dan Johnson were the only International League hitters from any team to top a 1.000 OPS in more than 50 games during the previous five seasons. Plouffe sits atop a list that includes Span's aforementioned breakout and the final step Kubel and Justin Morneau took before becoming impact hitters in the majors. It also includes Randy Ruiz and Brian Buscher, so a .900 OPS in Rochester doesn't guarantee stardom in Minnesota, but then again Plouffe posted a 1.019 OPS, not a .900 OPS, and the only two Rochester hitters in nine years to come within 100 points went on to be two of the best bats in Twins history. There's plenty of reason to be skeptical, as even with this monster season thrown into the mix he's a .262/.316/.451 hitter in 337 games at Triple-A. Those numbers translated to the majors project poorly at shortstop, let alone right field, but the breakout was so spectacularly out of character that it may make Plouffe's track record an afterthought and there's still a shot he can handle a position with more defensive value and a lower offensive standard than right field. The sample size is probably too small to matter, but I would still mention the fact that Plouffe has two home runs and a .250/.368/.625 line in 18 plate apperances since coming back up. I think the Twins would be happy if Plouffe becomes what they had hoped Brendan Harris would be. Not exactly what you would hope for a first-round pick, but still useful. Since he was a fast-rising first round pick that stalled out at AAA, I have been wondering for a while (if not years) if Plouffe might take a Span-like turn at some point. BP’s found that they had to adjust projections not only on track records, but aloe adding an extra bonus for first rounders. There is some reason they were picked first round, and it might not show up until later. One of the reasons to not totally write off Delmon Young. No one ever mentions that Span had LASIK just prior to his breakout performance. I can’t believe that wasn’t a key to his improved ball/strike recognition. People do usually mention the LASIK and I’m surprised Aaron didn’t. I think a study was done on one of the stats sites on the interwebs that showed LASIK did not provide any statistical change for those that had it done, but I’d have to find it again to be sure. It is certainly possible that Plouffe has grown / changed enough that he’s now a legit propsect again. I hope so. The farm system hasn’t exactly produced many hitters lately. If Plouffe is a legit hitter, and Valencia is not, I think Plouffe should get a real shot at 3B at some point. I like the LASIK theory. I had that surgery about eight years ago and my eyesight went from 20/40 to 20/10 (20/5 in the eye I had surgery on). I could see like a super hero. My optometrist said she only saw military sharpshooters with that kind of eyesight. It only lasted about one year and my eyesight has deteriorated since then. As for Plouffe though, I am not sold. But let’s not forget there are countless examples of guys hitting better in the majors than they did in the minors (Fred Lynn comes to mind but someone may prove that wrong). Beyond that, individual transformations can occur. Just look at Jose Bautista. No one would have predicted his success in the past two years from his past performance. Most of the guys in the majors are very talented. A simple mechanical change can make a huge difference. Wow, Delmon is only 9 months older than Plouffe. You could argue that Plouffe took a step forward last year, with 17 total home runs, and a .432SLG, despite only hitting .244. If you added about 20 expected points across his triple slash lines, his 2010 looks like a bit of a step forward, making this years surge not quite as anomalous. And he’s now got 20 HR on the year this year. Definitely trending well. I’m not sold on him yet, mostly due to sample sizes, but let’s remember, he was always pushed a bit. That said, I don’t think I’d simply write off SS for him. He’s got the arm and the range. I’d probably let him keep working on it, if for no other reason than if that bat is for real, we moved to massively above average at that position, even if his defense is a bit shaky. Is there some sort of mechanical adjustment Plouffe made? That was the story with Bautista – and looking at JBau I find it hard to believe that he’s juicing. Did Plouffe figure out some critical piece of the puzzle that was eluding him before? If so I find that believable – the question is whether he can keep that up. Plouffe’s defense at SS for the Twins wasn’t a bit shaky, it was terrible. Still, he could be a Punto utility type next year, backing up half the positions. His value would rest mostly in his bat, though, instead of his glove. Is the Matt Tolbert era officially over now? Let’s hope the Tolbert era is over…..If you look at WAR on Fangraphs, and compare Plouffe and Revere, it is interesting (though Plouffe has a much smaller sample size). I’d really like to see Plouffe play more often, and see if he’s made a legit adjustment or not…..Frankly, I’d rather see Plouffe in LF right now than Delmon, and I never thought I’d say that in a million years. As much as I’ve said Delmon is over rated by the fans, I always figured he was better than Plouffe. Delmon looks more and more like one of those guys with immense talent, that just never puts it together. Kind of makes me sad. (1) Plouffe spent most of his minor league on the uber fast track. 18 E-town, 19 beloit, 20 ft myer, 21 new britain, 22 NB/rochester. current twins on this track are Miguel Sano, Oswaldo Arcia, Kepler, and Liam Hendriks. That’s basically it. Hicks and a few others a year behind. All the way up to Rochester, Plouffe kept his head above water offensively as an infielder against much older competition. Those are simply good, positive-indicating seasons. He had a disappointing 2010 fueled by a flukishly low BA. It happens. (2) Sometimes power develops slowly. People use this as an excuse to overrate bad corner prospects too often (oh, he’ll great when he turns 25 and those ground outs start turning into home runs). But those same people seem inexplicably confused when it actually does happen, but just not to one of their Chosen Few. That seems like a clear trend of developing power. But while it’s easy to fail to exceed replacement level as a 25 AB/HR guy, it becomes difficult as a 13 guy. That’s 50 HR power. And he’s showing it in the majors. (3) He’s always had a decent approach at the plate. Never had a redflag strikeout issue or a notable lack of taking walks, both the kind of issues you might expect might be exploitable by major league pitchers. (4) He does not appear to have the “hitting for average” tool. He once hit .274 over a season. Popouts turning into homers should give him a slight boost, but this issue probably isn’t going anywhere. Learn to love .245. Let’s all hope we can rip him for this at some point. Question, I’m basically assuming Cuddyer is going to be back next season and Kubel will not. 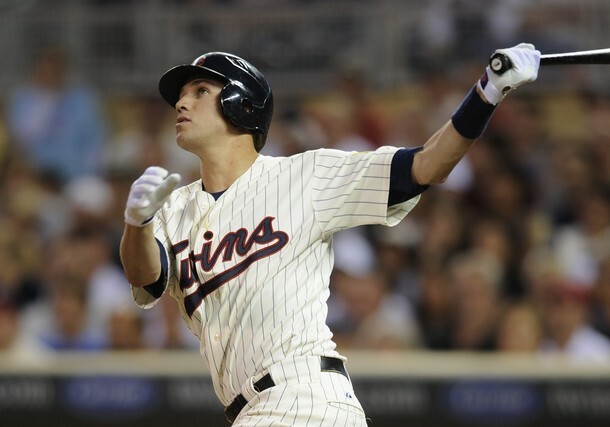 Now the Twins are really left handed, but would letting Kubel go in favor of Cuddyer be the correct choice? If Plouffe continues to hit isn’t he basically Michael Cuddyer with likely better defense at the exact same positions and below average at shortstop, while making the minimum? Assuming Delmon is not traded and only one of Cuddyer and Kubel is returning, wouldn’t it look better having a left handed power bat to go with Revere, Span, Delmon and Plouffe, to add another dimension to the outfield/DH rotation? The infield (assuming it remains the same) is a righty with pop, a lefty with pop, and two slap switch hitters coupled with Mauer, two lefty singles hitters and a couple righties with power potential, I see a need for a younger lefthanded bat with pop more than an aging righty. Another weak hitting night by the Twins. Hitters 2 through 4 in the lineup went 5 for 12. Unfortunately, Ben Revere was batting leadoff again and went 0 for 4. His on-base percentage is now worse than Nishioka’s. I’d like the Twins to give Plouffe a chance as a Ben Zobrist type supersub. Play him all over the field and keep his bat in the lineup.